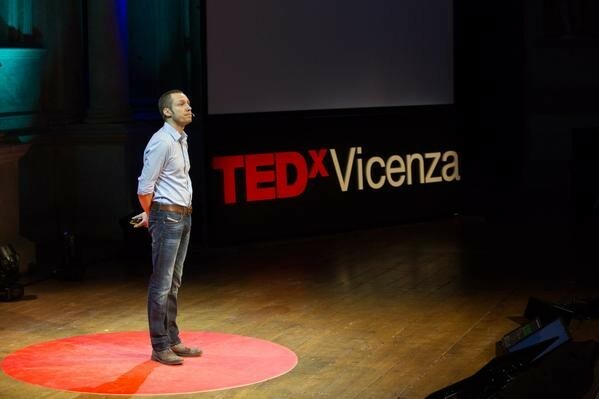 Over the course of the summer I had the great pleasure of speaking at a local TEDx conference in Vicenza, Italy. The theme of the conference was “Planting the Seeds” and the day consisted of 16 talks by speakers from various disciplines including agriculture, architecture, design, education, history, science, and technology. It was a truly marvelous event. It took place in the oldest, still standing roofed Renaissance theater, the Teatro Olimpico. The event was not only available as a live-stream online, but the team of organizers also set up an additional live-streaming location not far away from the theater. In my talk, I focused a lot on the research I am currently doing for my dissertation, in which I look at emerging practices of civic engagement on social media platforms like Facebook and Twitter. In particular, I related the use of social media during the large scale protest events around the turn of the decade such as Occupy Wall Street or the Arab Spring to anti-corporate discourses that have been popping up frequently on Twitter over the course of the last couple of years. I am very happy about the talk I have given. However, developing that talk was easier said than done, and it really reminds me of the importance of audience awareness which I frequently emphasize to my students who have taken the classes I teach at Georgia State. The first thing to note is that a TEDx conference, despite featuring academic researchers as speakers, doesn’t really compare to a traditional academic conference. This is because of two, related reasons: for one, the people attending those conferences by and large aren’t academics. They come from all walks of life. That means that the talk needs to be tailored to their expectations, and this usually means to wrap the topic of a talk into a personal story. While academic audiences at conferences prefer presentation content that solely focuses on research findings and results, TEDx audiences enjoy the story aspect of a talk because then the content becomes more relatable. Another crucial point to consider when it comes to preparing a TEDx talk, is that TEDx talks are usually between 8 to 12 minutes, and to make sure that nobody goes over their allotted time, a monitor in front of the speaker shows a countdown. So on the one hand, you’re constrained by the allotted time, and on the other you mustn’t neglect the story part in your talk. And I have to say, preparing my own talk was easier said than done. Luckily, I had the help of a TEDx speaker coach who worked with me on those aspects. And I cannot deny that it took some time to create a draft that was compatible with the format. The first draft I completed, for example, was roughly 17 minutes long. Way too long, and it didn’t actually include a story. And so it took some time really not only to trim it down so that the talk would meet the required time, which for me was 12 minutes, but also to find a compelling narrative that would function as a thread for the talk. Overall, this has been a truly marvelous experience for me, not only because I was able to share what I’m working on with a broader audience, but also because it taught me a thing or two about public speaking. I strongly encourage everybody to get in touch with a TEDx team in your area. In fact, Atlanta has a number of TEDx organizations like TEDxAtlanta or TEDxPeachtree that are always eager to find volunteers who believe in the TED motto: ideas worth spreading. But you actually don’t have to look so far. In fact, Georgia State University has its own TEDx team as well.